From that cavern, the party quickly finds their way to the surface, now within the realm of the Nightking, whose crystal castle they can see in the distance. Odo produces a sort of powder that places an illusion on each of the party members, making them all appear to be creatures with wings and bird's feet, but also a long, fish-like tail. This allows them to skirt a patrol of gnolls, who salute them as they pass, as well as two orcs on sentry duty at the castle's entrance. Unopposed, they advance through the seemingly empty castle until they reach a seven-sided room containing a large crystal prism. The Child has been imprisoned within it. To release the Child, Odo tells Tom that he must ask the Onelord for a miracle. Tom scoffs, "But we don't believe in him. Why should he listen?" One at a time, Fearless, Margot, and Tom appeal to the Onelord. Tom's request is: "Release him from the stone. That's all we ask. Amen." This seem to satisfy the Onelord, as the prism then cracks, and the Child emerges. Margot immediately takes charge of him, cooing, "You poor thing, you poor baby." The Child is silent; as Odo explains, "He can do everything but speak. He's incomplete until the Master holds him." Then, suddenly, the Nightking announces himself in "a lovely voice, mellifluous and rich." He is tall and slender, handsome, blonde-haired and smooth-skinned, wearing only a red toga, but he lacks eyes, instead having "two black, completely empty holes." The Nightking gloats over having now captured both the Child and the Chosen One, taunting the Child, "You'll never be the Master, boy." Margot voices her fears that the Nightking will kill them, but instead, inevitably, the Nightking says, "I'll leave you now." "This is your dungeon," the Nightking explains, "You are in it. There are no guards. The doors are open... which door did you come through? Can you remember? Was this the door?" In his villainy, he continues, "You are surrounded by my Underworld. The choice is yours." They can remain in the seven-sided room until the Master fades, or explore the castle, "for I have things outside in store for you." He then unceremoniously departs. While the party deliberates over which door to take, the Nightking raises the temperature of the floor in the seven-sided room until they are forced to choose. Drobni carries the Child as they make their way through a surreal snowy landscape that soon turns into a dungeon passage. "It's a maze," Margot concludes, "We're in a maze." The Nightking briefly interrupts to inform the party that "something is hunting for you." As they begin making their way from chamber to chamber, it soon becomes clear that a dragon pursues them. A dragon in a dungeon. The party is briefly separated, and Odo, Drobni, Margot, and the Child come face-to-face with the dragon. To save the Child, Odo throws himself into the dragon's jaws. But then Drobni, who cries "Not my Odo!" growls in rage and grabs the dragon's tail. Thumbless Drobni starts to "pivot," which throws the dragon off balance, and then "pivot harder, harder, turning in a circle," until the dragon is lifted off the ground, "not far-but just enough to swing it like a bolo, in a circle." Finally, Drobni releases the tail, and the dragon is flung into a stone wall. "We hear its skull crack as it crashes on the stone," and the dragon is slain. 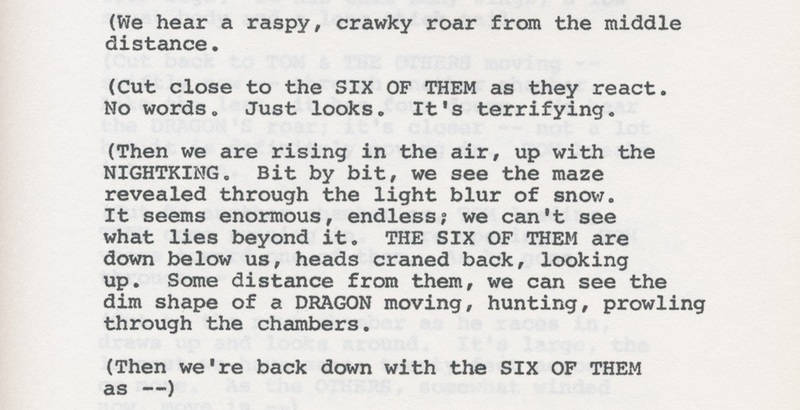 This is, incidentally, the sole slaying of a monster in the script.